“The number of Australians being injured by unsafe products is far too high, and we encourage people to sign up to recalls information or follow us on social media so they can be alerted to any potential risks in their homes,” Ms Rickard said. 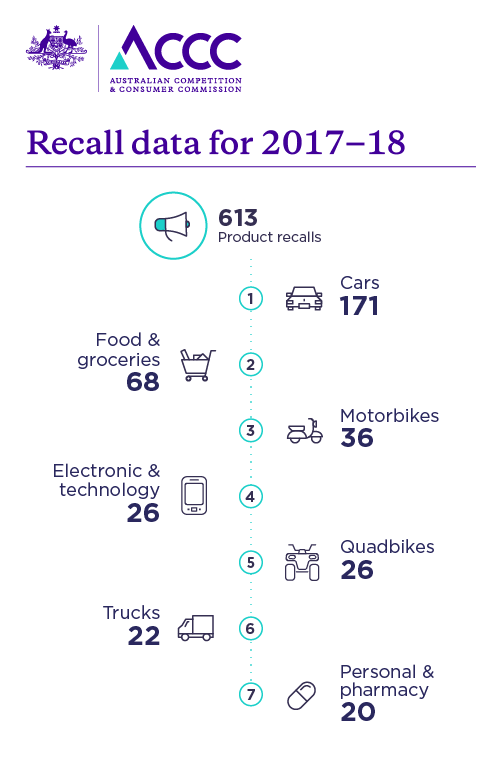 Recall notifications peaked significantly in the summer months, with products ranging from cars and caravans, to children’s toys and prams. Around half of these notifications are referred to specialist safety regulators for assessment, like food, building products and hazardous chemicals. Of the types of products the ACCC has sole responsibility for recalling, the highest represented categories included outdoor and camping products, kitchenware, furniture and items for babies and kids. “Parents and people with young children are encouraged to be aware of recalls that may affect products they have in their home. But the high numbers of injuries across Australia indicate many people will be injured or know someone who has been injured by an unsafe product at some point during their lives,” Ms Rickard said. “We strongly support the introduction of a General Safety Provision by the Australian Government, which is designed to stop unsafe goods from being sold in Australia,” Ms Rickard said. Consumers can sign up for tailored email alerts on the products that are of interest to them and their families. Consumers can also report an unsafe product to the ACCC by completing a simple web form to help protect others from harm.